Crisp is a creative arts practitioner: facilitator, teacher, therapist and creative artist. Within her artistic practice she engages participants multimodally. Gayle Crisp engages community with forms of expression such as dance, drama, visual arts, media, and play. Crisp’s creative arts practice is an ongoing exploration in communication with others as they explore meanings held in lived experiences. She engages community in a variety of contexts believing in the importance of creating meaning. Crisp works as a primary school drama teacher; her work being complimented by a variety of other projects. These may include workshops and one to one sessions, which provide the fertile space wherein she hones an authentic way of working. 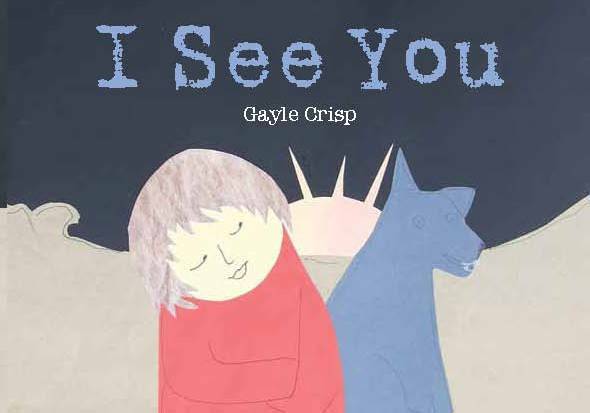 The publication of a small picture book called book I See You was designed for the use of therapists and educators working with people who experience anxiety and depression. The book I See You (2011) has been a welcome addition to shared methodology and a resource pool emerging from Queensland practitioners. Creative Arts Therapy is an emergent field of practice and in like manner Crisp’s work is emerging. She can trace the origins of her style to a curious childhood, which led to the development of a passion for meaning making through art. Within her arts practice she is immersed within a developing understanding of the value of the arts, which are inextricably linked to fields of education and wellbeing. Having studied an Associate Diploma of Arts leading to a Bachelor of Education majoring in dance, drama and media she continued to chase workshops, courses and participation in arts events. After years of creative immersion and active participation Crisp went on to a Masters of Arts in Experiential Creative Arts Therapy at MIECAT. This culminated in an integration of complimentary creative arts, educational and therapeutic skills, which amplified her values. This syntegration provided incubation space for exploration of innovative ways of working. When asked about her decision to cut an innovative and authentic path through the disparate world of creative arts practice, Crisp explains that one cannot measure an integral part of everyday life. I realise that on a practical level that many of the hours I have spent every day over the years consumed in learning, practising, playing, networking have not been money making ventures…but they have been enriching to life and part of who I am. I have my bread and butter job part-time drama teaching and I develop other work around it and through it. This is spasmodic but becoming more frequent. The caption above describes Crisps staunch approach to trail blazing through the “status quo” art world extant of Queensland. Beginning where I am has become fundamental to my developing work. I start with what and who I know; I keep my senses open for places my skills will be of use. Relationship building as well as finding the meeting places with those that I am trying to connect is important to making inroads into organisations and systems. When Crisp talks of ‘meeting places’ she is thinking about culture as she endeavours to learn the language and recognise values of the communities she enters. Through dialogue she ascertains whether she and they are able to meet on the same page and have meaningful dialogue around how to can work together. Networking with other like-minded people is imperative to her self care and development as a practitioner: so she organised a support group for others like herself called BrizCATs. Crisp didn’t set out to become a leader or unsettle the status quo of the traditional art world within Queensland This honour fell onto her by default through networking, advocating and instigating connections. Crisp attracts connection with others and highlights understanding of the kinds of work possible through creative arts processes. She has become a voice on the web and in the community. When others approach her with questions it provides opportunity to fashion mutually beneficial connections. Crisp expects to keep walking though the landscape of her world with her eyes open to see where new fertile space will present for creative work, to connect, to build bridges between people and be creative. In this way she is visionary in a loose fluid unforced way. It will be interesting to watch as she pioneers the use of creative arts process in schools with students and staff to build understandings about experience, community and to assist a whole person centred view of education. It is fortunate that Crisp also has the energy to create visual resources for therapists and teachers. Her community work is complimented by a person centred approach to one on one work in her home studio. Her advice to aspiring creative arts therapists and educators who value this way of working is to be curious, notice, connect, network, support each other, explore, discover, create”. This entry was posted in authors, Book Reviews, illustrators, leadership, teacher Blog reviews and tagged BrisCats, Gayle crisp, MIECAT, multimodality, therapy on June 20, 2013 by Jo Murphy.